How important are proper grammar, syntax, consistency, accurate punctuation and diction (to name just a few)? After all, this is the Internet age where everything is fast, fast, fast–who cares if u r a gr8 writer, right? Your audience cares. Poorly written content goes right to the heart of your credibility. And before you can sell anything—a product, service, program or even an idea—you must be credible. You audience won’t tell you you need an editor. But they will notice—and your reputation will suffer because of it. Do you know who else cares about editing? Charles Duncombe. Mr. Duncombe is a businessperson who runs travel, mobile-phone and clothing websites in the UK. He took it upon himself to measure the revenue-per-visitor to tightsplease.co.uk, a British fashion website. The end result? Revenues doubled after the errors were corrected. Now, I’m not saying this will happen to you but are typos, poor grammar and murky writing worth the potential loss of revenue, donations or supporter loyalty? Contact me now at 613-850-5554 (talk or text), by sending me an email to ron@ronjette.com or by using the form below. 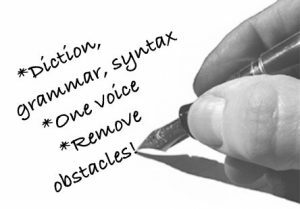 Line by line, word by word, I will help make sure your text is clean, clear, concise and compelling. Alliteration is free.